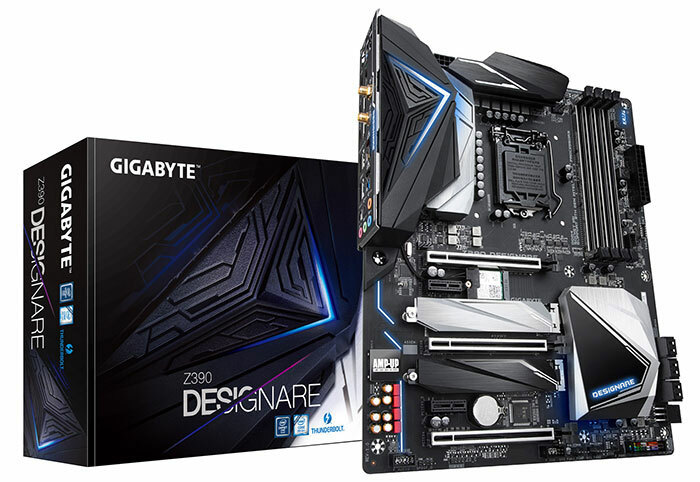 As is the fashion for new, high-end motherboards, Gigabyte's new x390 Designate board aimed at buyers of new processors like Intel's 9th-generation 9900K, there isn't actually a lot of board on show. With enormous backing plate covers, lighting, coolant shrouds, EMI heatsinks for the M.2 drives, and chunky VRM heatsinks, the board itself looks relatively well covered. And it's gorgeous. "Today's content creators are seeking faster and more efficient performance from their PCs. Gigabyte created the Designare series a few years back to fulfil these user demands," explained Jackson Hsu at Gigabyte, via Hexus. He said that the new board was "loaded with features that enable content creators to express their artistic creativity," as well as offering top-tier performance. The board is indeed high-end. It features "armor" on both the memory DIMM slots and the PCIe ports, giving some stability to heavier modules and add-in cards. Thermal guards offer EMI and heat protection to M2-slot SSDs too, and the VRM area has strong, multi-direction heatpipe and heatsink covers for added heat dissipation during heavy overclocking. To facilitate that overclocking, this board features a 12+1 phase digital CPU power design, while the 8+4Pin motherboard power connector delivers stable power to the board and its components at all times. Back panel I/O include a pair of USB-C ports with Thunderbolt 3 support, two USB-A 3.0 ports, two USB-A 3.0 ports for DAC-UP audion, two USB-A 3.1 ports, two USB-A 2.0 ports, a PS/2 connector, HDMI and DisplayPort outputs, a pair of Wi-Fi antenna connectors, twin 10GbE ports, and seven-channel 3.5mm audio connectors. It also features solid capacitors and long-life components for added stability and shelf life, RGB lighting, and smart fan controllers for better cooling and noise levels. The only thing we don't know is when this board will be available. It should launch soon at a price that we'd estimate for around $300.